Though Warren Buffet recently ruled out a double-dip recession in the U.S., ultimately it’s our country’s moms who will decide when the economy starts showing real signs of recovery. 75 million U.S. moms make or influence 85 percent of all household purchase decisions, representing $2.1 trillion in annual spending power. Brands are counting on American mothers to help them survive the current economic slump, but getting moms to unleash their “purse power” continues to be a struggle. With up to 45 percent of moms insisting they have “eliminated anything they don’t feel is absolutely necessary from their lives,” and another 29 percent having found ways to cut back on spending in response to the current economic climate, moms are putting brands, products and services under tighter scrutiny than ever before, and making sure every dollar is spent wisely. According to a BSM Media Study, moms focus on the needs of their families first, and then look for the smaller luxuries they can afford for themselves. Instead of a new pair of boots, in this economy it might be a new magazine or lipgloss. And while nesting was a social issue in the days following 9/11, today it’s an economic one, with 81 percent of moms cutting back on eating out, and 72 percent reducing their out-of-house entertainment altogether, according to a recent USA Today/Gallup Poll. What does this mean for marketers? It means that moms are interacting with their favorite brands in new ways – like Starbucks on a weekly instead of a daily basis, or Costco pizza instead of Friday night delivery. Experts believe this state-of-mind will continue even after the recession is over for many American families. Moms have always been more brand loyal than men, but they require more frequent interaction and communications designed specifically for them. Marketers need to make the extra effort to build relationships with their female consumers, whether it’s through social media, influencer recommendations or customer appreciation. They need to start marketing with moms, not at them. 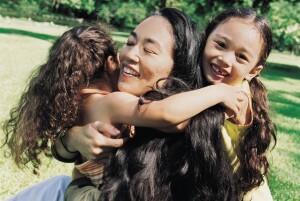 Are moms still loyal to your brand through these economic times? « Back To School Shopping With a Tween Boy	» Where Is the Tooth Fairy When You Need Her? We’ve made huge cuts over the past 5 years. We still go to the mall for clothes, but we pick thru the 80-90% off clearance racks, and my kids have been great about going to Goodwill (whatever the brand may be), as long as the style is reasonable. We are buying more Costco goodies…$5 for a bag of frozen broccoli that will provide 6 meals beats $3 or more for a bunch of fresh crowns that will provide 1 meal. $20 for a huge bag of coffee beans that lasts over a month instead of $12 for a bag of brand-name beans that’ll last 2 weeks…no cereal snobs in our house, either…we eat store brand, brand name–whatever is cheap or at Costco that week. The list is a mile long, and without a doubt more will be added before this recession is truly over. I don’t know how “the experts” figure the it ended 18 months ago, because my family just keeps sliding further down the slope. Thanks so much for your post! You don’t know how many women I’ve heard from who are scratching their heads at the “recession is over” news. If anything, many are finding themselves going into a new chapter of cutbacks. Let’s hope the recipe is identified soon for how to turn this all around. What planet is Warren Buffet living on? I’m with you — and the moms. Many thanks for the wise post.